Chvrches meets The 1975. That's one way to describe the sound of Prides. Like the former, they hail from Glasgow and operate on the bright electro-pop end of the spectrum; but like the Manchester band, the all-male Prides centre on bold melodies and a youthful, perhaps even laddish, tone. It's not the most original sound, then, but the result is a brash debut that's hard to ignore. After opener I Should Know You Better that sets the kaleidoscopic feel, it's Messiah that really leads the charge: stomping rhythms, synth licks and the staccato, breathless (and at times almost strained) vocal of lead singer Stewart Brock. Previous single Out Of The Blue follows the same template, alongside the likes of stadium-sized It's Not Gonna Change and the infectious "I wanna be" lyric of Little Danger. The three-piece band are at their best on these tracks, delivering short, sharp hooks and an overwhelmingly catchy pop sound that's ideal for festivals (they sounded great at Glastonbury). Dig just a little deeper, though, and the formulaic nature of their songwriting is clear. The volume is too often cranked up to eleven - a bullish approach that lacks the delicacy of their electro-pop contemporaries. When they do write a ballad, it falls at the opposite extreme. The softly bubbling Let It Go provides a welcome change of pace, but Brock's gruff vocal doesn't lend itself to this sort of music. Later, Same Mistakes sounds like a boyband off-cut, and closer The Kite String And The Anchor Rope moves worryingly into folk territory. 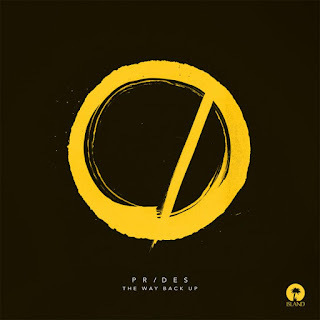 Skip those tracks, though, and 'The Way Back Up' is an enjoyable record full of masculine energy and powerful hooks - one that's best served in small doses. Listen: 'The Way Back Up' is available now.